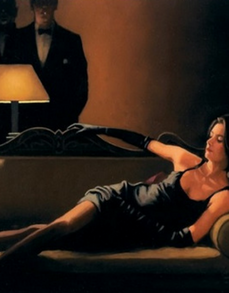 No Turning Back Limited Edition Print by Jack Vettriano available in this beautiful framed, mini format only. The framed size is approx 43 x 41 cms. Only 75 mini Limited Editions of No Turning Back were released, along with 7 Artist's Proofs. 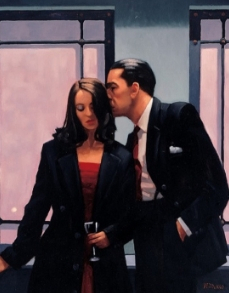 This mini edition is signed on the image in red pencil by Jack Vettriano to the bottom left hand corner and is numbered by him to bottom right hand corner. 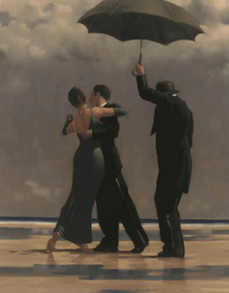 A reverse of Vettriano's standard Limited Edition Prints. The frame selected by Vettriano for the mini editions is a hand finished art deco style frame, with a hand-gilded inner bevel edge, which completes the image perfectly. Glazed in museum glass (non-reflective). This stunningly beautiful Limited Edition comes with a Certificate of Authenticity. Just The Way It Is and Showgirl and Game On we also released as mini Limited Edition Prints.